US Policy Towards Cuba is a comprehensive examination of U.S. policy towards Cuba after the Cold War, from 1989-2008. It discusses the competition between Congress and the executive for control of policy, and the domestic interests which shaped policymaking and led to the passage of two major pieces of legislation (the Cuban Democracy Act of 1992 and the Cuban Liberty and Democratic Solidarity Act of 1996, better known as the Helms-Burton Act) which tightened the embargo on Cuba and were fiercely resisted by U.S. allies. There is also a strong focus on migration as an issue in U.S.-Cuban relations. The book then moves on to examine U.S. policy during the second Clinton administration, when the interest group environment altered for two principal reasons. Firstly the case of the small Cuban rafter boy, Elian Gonzalez, attracted huge media coverage and led to public questioning of the wisdom of current policy, and secondly the agricultural lobby, keen to export to Cuba, lobbied for the Trade Sanctions Reform and Export Enhancement Act, which finally passed in 2000. The final section of the book analyses democracy promotion efforts under President George W. Bush. 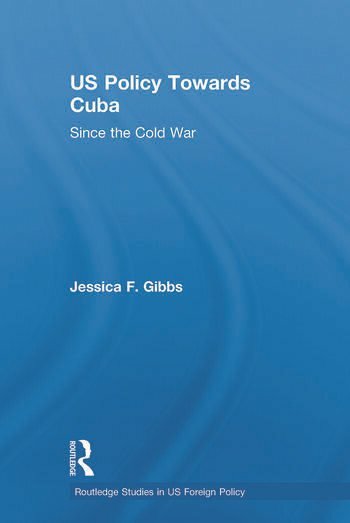 Seeking to cast light upon the US policymaking process, Gibbs demonstrates that U.S. Cuba policy represents a rather extreme example of the influence of domestic politics on policymaking, and provides a significant contribution to this important and under-researched aspect of U.S. foreign policy. Jessica F. Gibbs completed her PhD at the University of Cambridge in 2005 and lectures in History at the University of Aberystwyth. Her research interests include US foreign policy, in particular the influence of domestic politics on the policymaking process, US-Latin American relations and migration.